Check out our photo gallery of pictures from Grace Lutheran Church West Springfield’s trip around the world to Kirchentag 2009 in Bremen, Germany. Learn more about the trip by reading our previous posts on Kirchentag 2009. 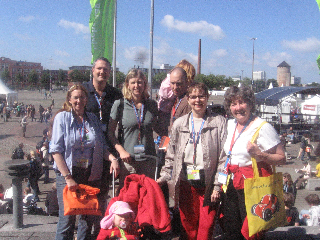 The group from Grace Lutheran Church West Springfield at Kirchentag 2009 in Bremen, Germany. This is Bremen's Cathedral Choir as well as Bremen's Philharmonic orchestra singing with the audience the entire piece of Hendel's Messiah. Ken and Pastor Harman. Ken is a new friend Pastor made at the international center of the Kirchentag. 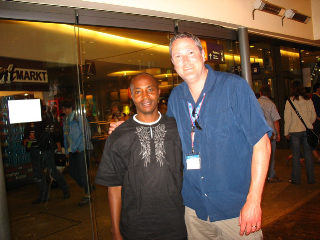 He is a minister in Kenya and led a group of 45 or so from Kenya to experience the Kirchentag and perform as well. Kenyan worship singing filled the halls at various times and it was a beautiful sound! 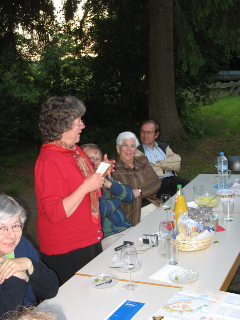 Martha invites people from the Lutheran congregations in Mariensee and Basse (where Pastor Harman was an intern) to visit us here in the U.S. They held a dinner and meeting for Grace's group to learn more about their church and for us to share about Grace. Overall this was a very enriching experience. 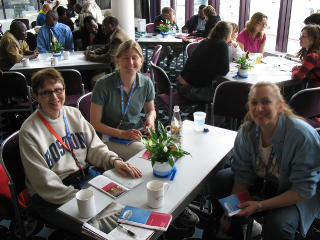 Bobbie, Kristen and Barbara from our group taking a break from the Kirchentag events at the international center. 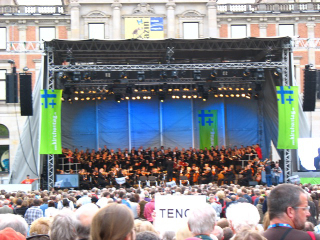 This entry was posted in Events, Multimedia and tagged Kirchentag by Eric Parizo. Bookmark the permalink.